Mother’s Day is a special day for both moms and kids. It’s a day for kids to let their creativity shine in honor of their mom. There are so many fun ways that kids can shower their mom with love on Mother’s Day – here are some fun Mother’s Day brunch ideas to help inspire some creativity. Create Homemade Placemats: Have your little ones create a personalized placemat to serve Mom’s meal on. Here are some fun suggestions for creations. Create a Menu Card: After Dad & the kids decide what they are going to make, the kids can make a cute menu card to leave on the placemat for Mom. This can include the menu and some fun drawings. Fun Napkin Designs: With a little bit of Google research, you can create a fun folded napkin to go on Mom’s food tray (for breakfast in bed) or place setting on the table. Fruity Drinks: A plastic champagne glass can be used for a fruit smoothie creation invented by the kids. Fresh Flowers: Setting fresh flowers on the breakfast tray or on the table is a sweet touch that any mommy would love! Breakfast & a Show: While Mom is enjoying her special meal, the kids can put together a special talent show in her honor. This could include magic tricks, singing, dancing, poem reading, etc. 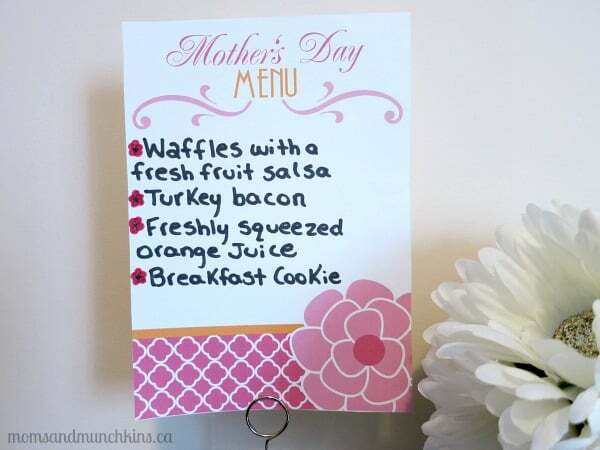 You’ll also want to check out this post with links to some great FREE Mother’s Day printables that you can use with your Mother’s Day brunch ideas (including the free printable menu card by Amanda’s Parties To Go featured in the photo above). For more fun Mother’s Day ideas, check out our Holiday Fun page and scroll down to May for the Mother’s Day section. From my family to yours, Happy Mother’s Day! I hope you have a special day full of fun with your family. We’re always adding new ideas for family fun. Follow us on Facebook, Twitter, Pinterest and Bloglovin’.